I’ve always wanted to throw a cocktail party. Nothing like those let’s drink until we run out of alcohol parties in college, but a classy, let’s have interesting and worldly conversions in my gorgeous backyard kind of party. When I do have a giant backyard with fruit trees and herb beds and a swing set and a tree house, I am definitely inviting you over a cocktail party. I’ll tell you about how I grew the peaches and limes. How I’m constantly fighting with gophers and aphids and other gardening woes. Why peaches and lime? 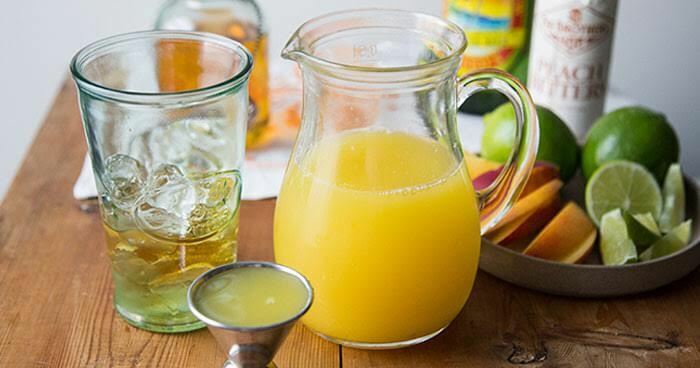 Because those are two important components of this deliciously tasty ginger peach cooler. 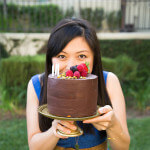 ABOUT MARYANNE CABRERA: Maryanne is the recipe developer and photographer of the award winning food blog The Little Epicurean. Through her blog, she shares countless stories of her passion for baking and sharing food with loved ones.